Russia 1929 | The Happy Wonderer ~ ellen b. In October of 1929 the Communist authorities issued edicts forcing the collectivization of all farms in Russia. We were to surrender all our earthly possessions to the authorities. There was to be no individual ownership of anything. We realized that we could not live under such conditions so our network of villages chose not to cooperate. Nine men, my father being one of them, were chosen to travel beyond Russia’s borders into Iran to scout out the best possibilities for future residence. This was done in accordance with the previous agreement worked out with the Russian government. In order to induce our people to come back from Turkey years before, the government agreed to allow us, as a group, to leave at anytime whenever we so desired. An additional purpose for the trip of the nine men was to officially petition the Shah of Iran for special refugee status for us Russians. But almost immediately after the departure of the nine, the authorities descended upon our village one night and the next day and arrested all the men. This amounted to nearly 300 men. They were each tried and given sentences of three to fifteen years at hard labor in Siberia. Nearly ninety percent of these men died there – never seeing their families again. My mother, upon my father’s departure, was left alone with all the children, many of whom were very young. In addition we were under constant harassment from the authorities because they knew that my father had escaped. Life became increasingly difficult for us under these circumstances and so my mother decided that we should leave. We gathered up what we could of our possessions and left our village. We traveled to Rostov to the train station. We arrived there too late in the day. The trains had already departed and so we slept on the streets that night. We left Rostov for Baku the next day. We arrived in Baku, boarded a ship, and crossed the Caspian Sea to Krasnovodsk in Turkmenistan. From there we took the train to Ashkhabad which was near the Iranian border. There we would stay until conditions were conducive for an escape. In the mean time we invested in a horse and wagon and built a small delivery business, my older brother John being the chauffeur. We hauled all sorts of products – watermelons, cantaloupes, bread, perogies, candy. I always rode along with my brother and got to sample many of the wares. I still remember the great tastes of some of those products to this day! 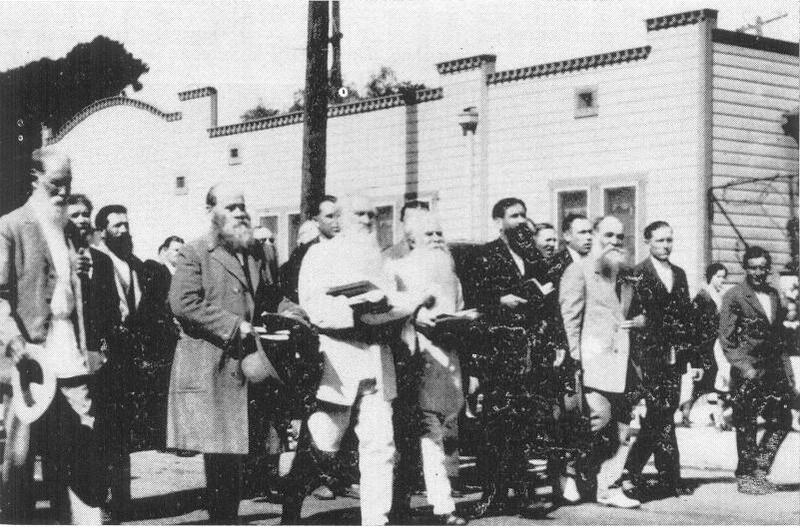 The photo at the top of this post is of a group of Russian Molokans going to church in Los Angeles. They kept the same dress from the time they escaped from Russia so this group would look a lot like the men of the villages that were rounded up and sent to Siberia.